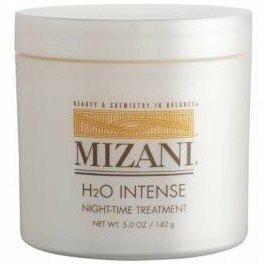 MIZANI H20 INTENSE NIGHT TIME TREATMENT -Mizani H20 Intense Night-Time Treatment is a "Dermatologist Tested" night-time treatment with Shea Butter, Vitamin A Derivative, Vitamin E, Pro Vitamin B5 and patented Ceramide strengthening technology designed to increase hair strength, reduce the formation of split ends, enhance moisture retention, control dryness and frizz without weighing the hair down. Directions Use at night, 2 to 3 times per week, as needed. Apply a small amount into hands and massage through hair.